Recipe by Denise Santoro Lincoln. 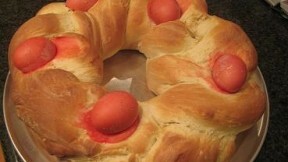 A mix of old and new traditions, this Easter bread incorporates eggs and a lemon sugar glaze. In a large mixing bowl, combine the water, sugar and yeast. Let stand for at least five minutes or until it foams (see picture). Note: If you are using your stand-alone mixer to make the bread, use the mixer bowl. Heat the milk in a pot on low until it's warm. Mix the milk, eggs, oil and salt in a medium bowl. Add the egg mixture to the yeast mixture and stir. Stir in four cups of flour. If using a mixer, such as a KitchenAid, use the dough hook. Slowly mix in about two more cups of the remaining flour, or until the dough no longer sticks to the sides of the bowl. Note: the dough should still look glossy. Lay the dough out on a wooden cutting board or counter top dusted with flour. Knead the dough, adding in the last cup of flour if the dough gets too sticky, until it is pliable. Put dough in an oiled bowl and cover with a piece of oiled plastic wrap. Let it rise for an hour or two, or until it doubles in size. Punch dough down and divide it into three equal pieces, stretching and lengthening each piece so they are about two-feet long. Braid the pieces together in a circle, joining the ends. Cover with the oiled plastic wrap for 30 – 60 minutes, or until it rises further. 14. Bake the bread at 350 degrees for 20-30 minutes or until it is golden brown and cooked throughout. Note: the bread only took 20 minutes in my convection oven. Remove bread from the oven and place it on a serving dish. In a medium bowl, mix one cup of the powdered sugar with 1 Tbsp of the lemon juice and 1 Tbsp of milk. It should be the texture of soupy toothpaste. Spread the glaze onto the bread with a pastry brush. Let the bread cool for a few minutes with the glaze and then make another batch of the glaze and recoat the bread.